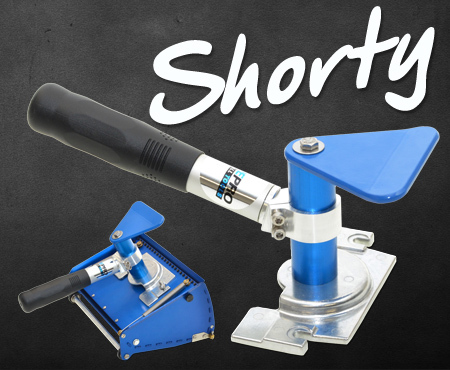 The Shorty attaches to your flat box the same way as normal handles, but has no moving parts – no brake. It consists of a control grip, and a push plate. The grip can be be adjusted for height and angle, and it’s easy to sweep the flat box off the wall. It feels more like an extension of your hand. Handy for confined spaces where a normal handle won’t fit, or for added control and balance when working at height – great for scaffold work or when using stilts. You’ll also find those high or low joints easier when you can get closer to your flat box. The Shorty handle can also be used to give an “Auto Box” style assist. Simply extend the fingers of the hand on the push plate and grab the lip of the flat box radius plate. You can then squeeze the two together to push more compound out. Handy when you’re in a difficult position.